And here are the measurements of my particular scarf if you’d like to adapt it to crochet, hand knitting or loom knitting. 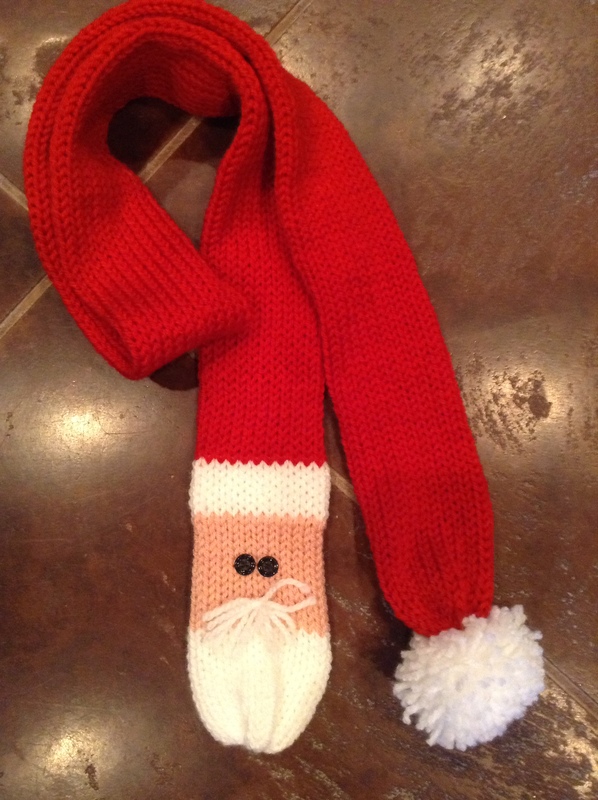 i want to tell you i love your pattern for the santa scarf and thanks for sharing. next iam going to make is your santa scarf i hope i can do it on the loom. well iam now doing the santa scarf and its going long because i go slow on my loom. what if you run out of the red yarn before the 240 rows? Remember that the row count I gave was for use on the Addi Professional. Use measurements when working on your loom (or crochet or knitting needles). If you need to add more yarn, use the same yarn and add it the same way you would change colors. well i was going to long on the red on the scarf so i stop at 223 rows on my loom is that ok to do ?that means i had to change the pattern a little bit on the red. hello margaret I am proud to say that my scarf turned out just like yours so Iam very happy about it. my next one will be a little better and shorter. 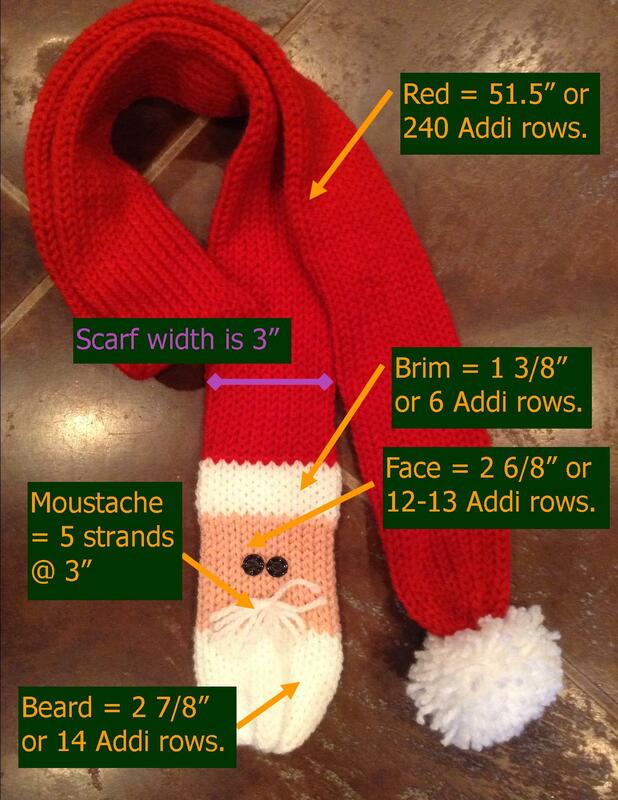 Got my addi one day and the next made the Santa scarf for my 86 year load mother and it came out perfect. Now have made two santa sand one snowman. Can’t wait ti make the nutcracker. Hope you can come up with a reindeer scarf. Thanks for the videos. That’s great, Terry! Fun, aren’t they? Reindeer? Hmmm…. Has anyone crocheted this scarf? Yes! I’ve seen pictures. (I prefer the look of the ones done with HDC.) Use the measurements to determine how many stitches to do each color as yarn, gauge, hook size could alter the proportions.